Rose gold Is very on trend In the traditional shaving world. The Muhle Rose Gold traditional shaving Set seems to have a Jewelry like aesthetic. 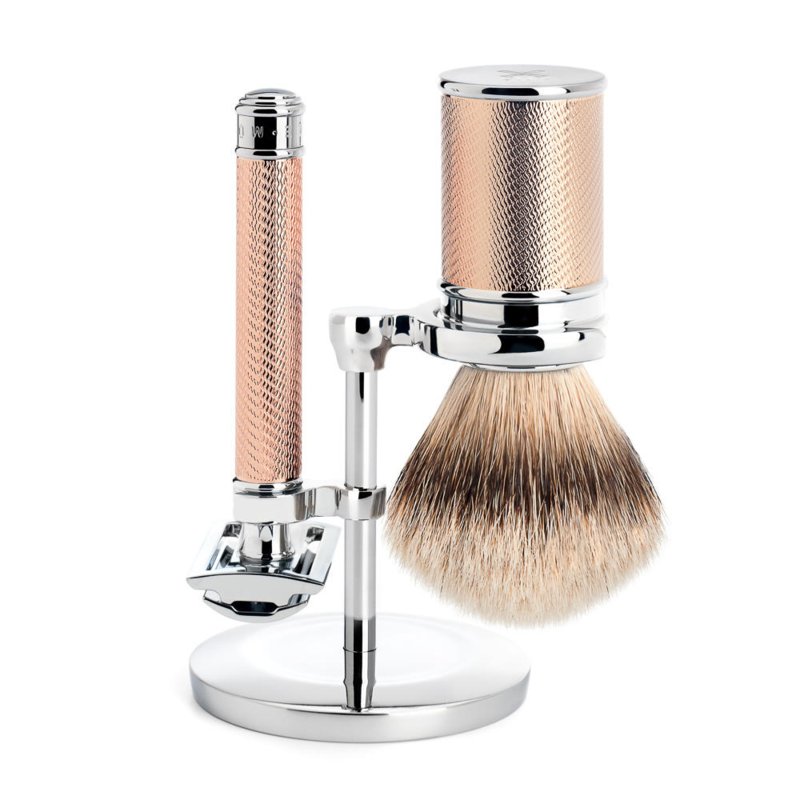 The rolled plated chrome lends a lattice effect to both the razor and the brush barrel. Creating a thousand sparkles In the light. 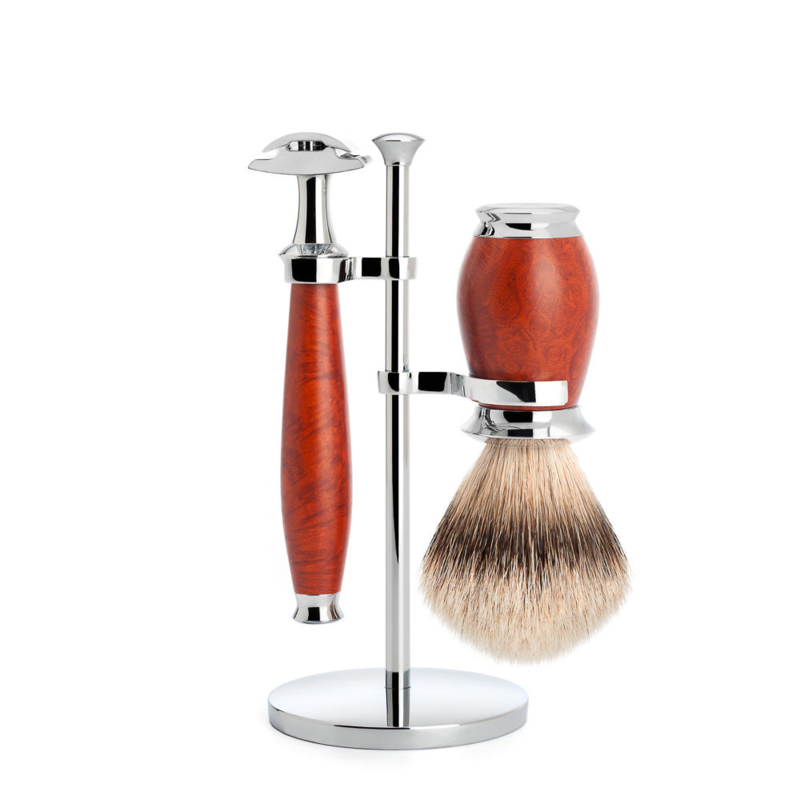 This 3pc set from the artisan traditional shaving company Muhle. Contains a safety razor which has a closed comb head, making this a great all round shaver. The craftsmanship of the Muhle Rose Gold traditional shaving Set, Is excellent the razor and brushes engineering Is flawless. Lined with brass the rose gold R89, which Is one of the most popular safety razors for practical design weighs in at 64g. It seems perfectly weighted at 94mm and Is a great razor to handle. The brushes knot Is silver tip badger, being the finest hair of the animal. Badger Is selected for It’s absorbent qualities and also how It exfoliates the skin. The traditional shaving brush Is 105 mm In height and has a knot ring of 21 mm, the brush weighs a hefty 127 g, handling It as a product makes you realize It’s quality. My favorite feature of both Items, Is the Muhle lettering In the base of both the razor and brush, It is so precise and well engraved, It really feels that every brush and every razor Is special. The stand Is stainless steel, and handmade at the Muhle factory. Edwards traditional shaving emporium Is an official retailer of Muhle, and the Muhle Rose Gold traditional shaving Set.